Mitchell College Library and Information Services is celebrating the First Year College Common Read, This I Believe. This special edition BOOKlights and the accompanying display on the upper level of the Library features a collection of personal essays and memoires including contributions from the Mitchell Community. If you would like to submit your own personal essay to be added to this blog, please email it to askLIS@mitchell.edu. This I Believe is an international organization engaging people in writing and sharing essays describing the core values that guide their daily lives. 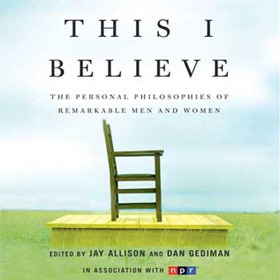 Some 100,000 of these essays, written by people from all walks of life, are archived here on our website, heard on public radio, chronicled through our books, and featured in weekly podcasts. The project is based on the popular 1950s radio series of the same name hosted by Edward R. Murrow. All my life I’ve seen the world through fiction. Telling a good story is my expression, my faith, and my craft. Ever since I can remember – writing has been my connection to the world. I’ve spent my life sending messages out to the world through stories, novels, and reading them back into my subconscious. Being dyslexic, I have always struggled with the mechanics but not the creativity of my personal expression. Creativity has always been my proving ground, my refuge, and the place where I am useful. In lieu of a higher power, I believe in the compassion of people, the connections they make, and the struggles we all face. I didn’t learn this from the so called “good book,” but from hundreds of great novels, stories, and ideas. My family has given me many gifts, but none so important as the gift of conversation. Not casual conversations, but sitting around talking about ideas, art, books, politics, and how it becomes art. These conversations allow me to think, compare, read, and write. It also inspires my teaching practices and philosophies. Being an atheist, I feel that faith isn’t a terrible monster, but something that doesn’t connect directly in my life. Passion, conflict, truth, confusion, and belief don’t have to revolve around a holy spirit or one great book. My life doesn’t revolve around a heaven and church. My life revolves around ideas, work, and vivid creative expressions. The powerful lesson that creativity teaches us, is that the more we learn how to write a convincing short story or essay, the more we realize we can do it better. The more we write novels, the more we want to write better novels. In music, the more proficient you become at playing an instrument, the more the world catalog opens to you. This is an exciting and expanding way of engaging life. I don’t need national arts funding to live a creative and expanding life; I just need to find creativity in my every day. I fear death and what happens when we are gone, and a lot of people look to faith for answers. There isn’t an answer. No one knows. So, we deserve to give ourselves that best life, creatively and compassionately. As E. E. Cummings said, “It takes courage to grow up and become who you really are.” My place of worship has been libraries, books, and ideas. Coleridge, Emerson, Tolstoy, Cather, Orwell, and Virginia Woolf have been my creative mentors and guides along with a thousand others. Their voices resonate in the pages of books, across the silver screen, and now into the digital age. And they have raised me to be a good, conscientious, creative, and compassionate man. My family gave me a great home life, with support, and the disposition to be creative. Novels, essays, poetry, movies, and plays have been my guide through a creative awakening. Every work of fiction reveals the truth in humanity. I hope to haunt those convergent halls, flipping through the pages of my everything. Ron Samul is a writing instructor for Mitchell College and Thames Academy, a journalist, book reviewer, editor, and graduate mentor. He holds an MFA in Creative and Professional Writing from WCSU and lives in New London, Connecticut. In 2006, he was the winner of the Connecticut AWP Fiction Award for the story Paper Thin.